Assembling braided stainless lines with hose ends can be a tiring experience. It takes a lot of practice and wasted hose ends, unless you have a KOULtool™. 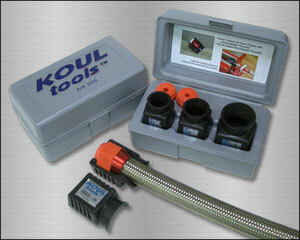 “KOULtools™ are simple to use and will save time and fingers from the frayed ends of a braided hose . After choosing the correct “KOULtool™” for your fittings socket size, simply place the socket and adaptor ( if required ) into the “KOULtools™” and clamp it into a vise. Lube the funnel entrance and twist the hose into the socket. Do Hand Held Abrasive Blasters Work?